The Telekinetic Incident is a new platformer physics based puzzle game from Mathew Fearington. In this game your goal is to pass 30 levels riddled with blocks and laser activated doors while keeping yourself alive. Occasionally, you will have to also help another nameless person to get to his exit before you can exit yourself. The physics of this platformer is quite good the laser puzzles are quite clever and challenging at times. As per the story, it has an intriguing one that is told in a humorous manner by a funny voice actor whose name is Fred. This unseen character will guide you throught game explaining you the basics and everything you need to know in order to survive and pass each level. Anyways, as this game is a puzzler it's most likely that one of you reading here have already been stuck on some point of it. 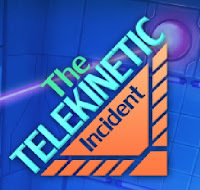 Well, I did get stuck at some levels of this game but fortunately I managed to overcome it and record The Telekinetic Incident Game walkthrough out of it which I am sharing with you now!